All transactions are safe and secure with a reliable history in online purchasing behind each of our associates. 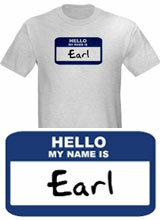 Buy the Hello My Name Is Earl Name Tag t-shirt to own My Name is Earl clothing and merchandise. The blue design on the front of this piece of My Name is Earl merchandise displays a name tag for the TV show's main character, Earl Hickey. This My Name is Earl name tag t-shirt offers a unique and humorous twist on the familiar logo from the TV series. The best thing about this name tag is that it will never fall off the tee. This bestselling apparel item is a great gift for fans of the show, even if that person's name is not Earl. Whether you're going to watch reruns on TBS, or My Name is Earl NBC episodes on DVD, this is the perfect attire in which to enjoy the entire cast. In addition to the Hello My Name Is Earl Name Tag tee above, browse the My Name is Earl Clothing Gallery for more apparel like men's and women's clothes, kids shirts or hoodies.